Are you suffering from dry eyelids? Perhaps it’s just a small dry patch, or maybe the flaky skin covers your entire eyelid. Either way, dry skin on your eyelids can be very irritating. It is a common issue, though, hence why there are so many creams on the market intended to help reduce or banish symptoms. We detail some organic, vegan and all-natural moisturizers for dry skin on your eyelids at the bottom of this article. Before we get into all that though, we are going to go through the different types and causes of dry eyes and eyelids. After all, knowing the cause of your dry eyelids can help you treat it properly and perhaps even prevent it from happening in the first place. There are several parts of our body that we often take for granted, not fully understanding and appreciating the role they play. One of the key players in maintaining our ability to see clearly and keeping our eyes healthy is the eyelids. Although overlooked, dysfunction and irritation of the eyelids can have negative health consequences. Remember, they act as a protective layer to your eyes, preventing dust, irritants, and foreign objects from potentially causing greater injuries to your eyes and subsequent vision changes. Related: What Causes Dry Eyes And Can It Be Prevented? Additionally, the eyelids act as an additional layer of skin, which means that like other skin, the skin on your eyelids can become dry and irritated. This may be a normal consequence from the climate of where you live, acute irritation, but if these symptoms are prolonged without treatment, they can lead to skin disorders and conditions that may be dangerous. 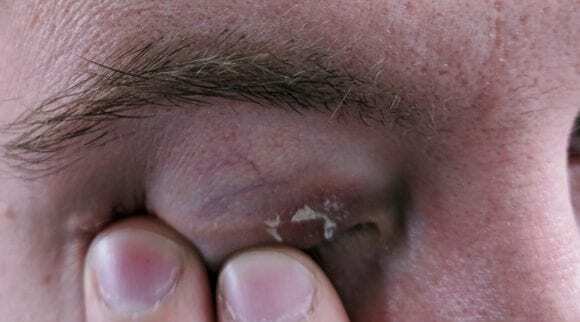 This article will be discussing dry eyelids, eyelid dermatitis, the various causes, and different products available on the market for treatment. We will first start our discussion with eyelid dermatitis. Eyelid dermatitis is a general term that covers a group of inflammatory skin disorders, specifically localized to the skin on the eyelids. What you’ll typically see as a result of eyelid dermatitis is a rash, which is often very itchy, on top of inflamed, reddened skin. The skin affected by dermatitis might further develop blisters or a crust like surface; this may lead to deeper infections and subsequent oozing of the skin. It has multiple causes and can manifest itself in a variety of forms. 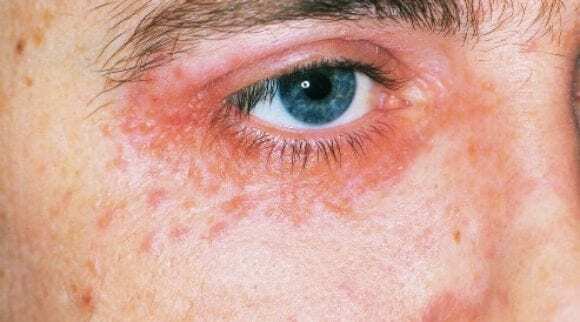 Similar to other forms of dermatitis, symptoms may include itching, swelling, pain or a burning sensation, red or irritated skin, or even thickened skin. 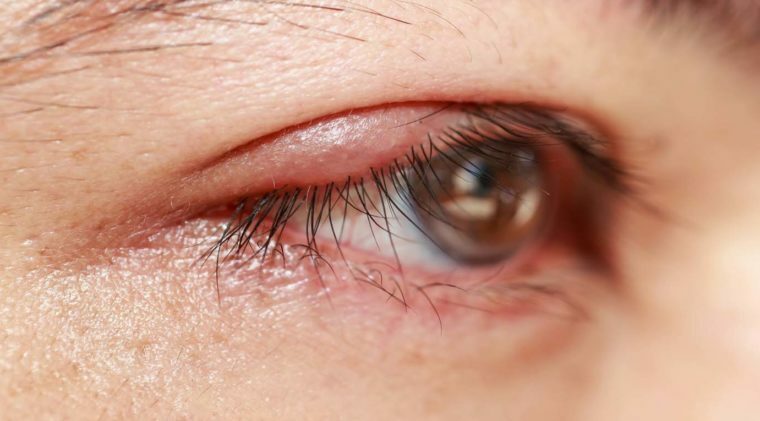 These symptoms are universal between the various types of eyelid dermatitis. As the name implies, eyelid contact dermatitis is a localized skin reaction usually as a result of a causative agent that has been applied. So, what are the different causative agents that can lead to eyelid dermatitis? It can result from chemicals, irritants, allergies, foods, or systemic issues. There is no singular universal presentation of contact dermatitis; the clinical manifestation of the condition varies for every individual and its cause. As previously mentioned, the symptoms you may experience include redness, small or large blisters, swelling, dryness, cracking of the skin, thickened skin, or changes in pigmentation. We will now further differentiate between the types of contact dermatitis. Chemical burn-induced dermatitis occurs after a single exposure to a chemical agent, typically in the form of a strong acid or base. 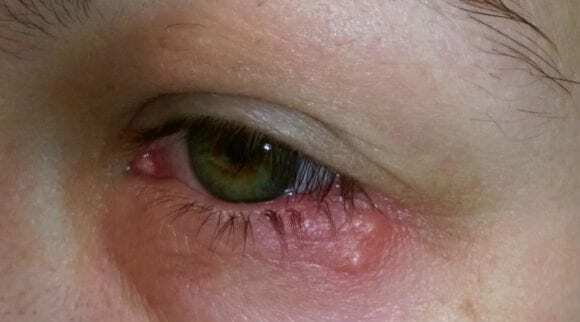 In this form of dermatitis, only the skin that comes in direct contact with these agents are affected, so in this discussion of eyelid dermatitis, it is less likely to occur, particularly as most people are not exposed to these agents in their homes or jobs. It is important that you utilize the proper protection materials, including eye protection, whenever you are in contact with these materials. Irritant dermatitis may occur after a single exposure; however, it more commonly occurs after repeated exposure to a specific irritant, including soaps and detergents, mild acids and bases, or solvents. Unlike chemical burn-induced dermatitis, irritant dermatitis can spread to other parts of the skin. However, it is important to note at this point that the radiation of symptoms to other skin is extremely rare, and it is much more likely that your symptoms will be localized to the skin that has been exposed to these irritants. It is more common in people with a previous medical history of skin-related conditions. Allergic dermatitis occurs when, as its name implies, the skin comes in contact with an allergen. Interestingly enough, this tends to occur after exposure with a substance that was previously not an allergen, meaning the onset of symptoms may be sudden. After the condition develops, small amounts of the allergen can induce symptoms. This type of dermatitis may also lead to a generalized spread of symptoms, called auto-eczematisation. Protein contact dermatitis results from contact with certain foods and is generally less common, particularly when localized to the eyelids. Systemic contact dermatitis is a rare form of contact dermatitis resulting from ingestion of a substance that has previously caused allergic contact dermatitis. This leads to a generalized worsening of symptoms. There is another form of eyelid dermatitis that can occur called seborrheic dermatitis. Although it sounds similar to eyelid contact dermatitis, it does differ in its symptoms and causes. Seborrheic dermatitis is another general form of dermatitis that can affect your scalp, or other oily parts of the body, including the face, nose, eyebrows, ears, chest, and clearly, the eyelids. It is more commonly known as dandruff. Obviously, you might be thinking that it would be impossible to notice dandruff developing on your eyelids, and you’d be correct. However, you may notice patches of greasy skin that are covered in small flakes along your eyelids, and also red skin, and/or itching. Unlike contact dermatitis, the exact cause of seborrheic dermatitis is currently unknown. Many physicians believe that it may be related to a yeast, Malassezia, which is involved in the oil secretion of the skin. They also believe the condition may be caused by an irregular immune system response. So, what exactly are dry eyelids and how do they differ from eyelid dermatitis? In terms of a clinical picture, the symptoms you experience will be fairly similar between these two conditions. 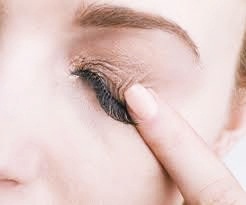 The skin on your eyelids will feel flaky, scaly, and rough, which leads to the overlapping symptoms of potential irritation, redness, and itchiness. Similarly, simple dry eyelids can subsequently lead to different forms of eyelid dermatitis. 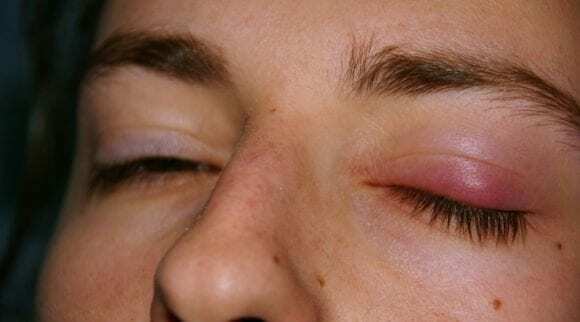 However, unlike eyelid dermatitis, the causes are somewhat different. As with all parts of your skin, the skin on your eyelids is subject to a variety of factors that can cause the skin to become dry. These include the climate where you live, including the temperature and humidity, and the natural process of aging. This is another condition that can result in dry eyes and eyelids. 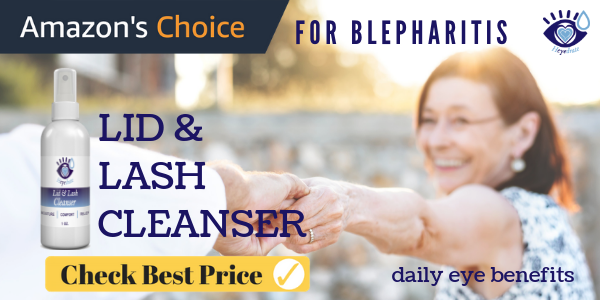 Although this dryness does not necessarily localize to just the eyelids, blepharitis can lead to other symptoms in your eyes and eyelids, including but not limited to watery eyes, red eyes, a burning sensation in your eyes, itchy eyelids, swollen eyelids, sensitivity to light, and more. 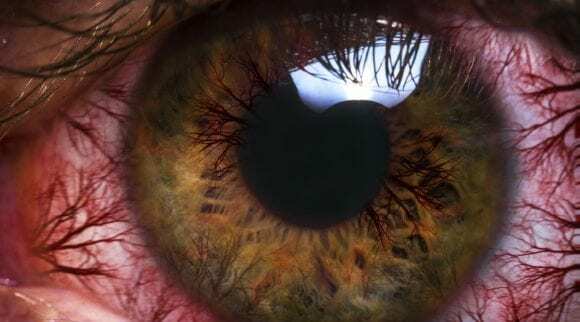 So, what is blepharitis and how does it differ from the previously discussed conditions? Blepharitis is essentially inflammation of the eyelids. It either affects the anterior area of your eyelids where your eyelashes grow or the posterior side where your meibomian glands are. It usually affects the eyes bilaterally. Related: Coconut Oil For Blepharitis? Can It Work For You? This condition is usually resultant from the glands near the base of the eyelashes, which secrete various oils that are important to our eye health, becoming clogged. This can lead to irritation of the eyes and eyelids, resulting in dry eyelids. Additionally, blepharitis can also be caused by seborrheic dermatitis, a bacterial infection, or allergies. As you can see, all of these conditions overlap in their symptomatology. 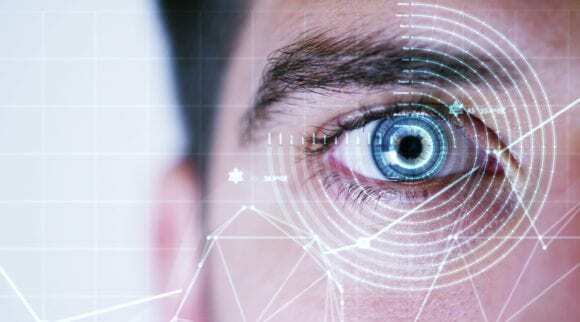 It is important if you begin experiencing any of these symptoms that you seek the consultation of an eye care provider to receive the appropriate medical diagnosis. Now that we understand the potential causes of dry eyelids, it is important that we discuss prevention before treatment. If you notice a specific product is associated with symptoms, such as mascara or eye drops, you should notice that cessation of that production should eliminate symptoms. Similarly, it is important to have good hygiene practices in place, including daily removal of all makeup and utilization of simple moisturizing products and lotions. If you have difficulty identifying the cause of the symptoms, seek the consultation of a physician, allergist, dermatologist, or another health professional, as they can utilize various tests that will help you identify the potential causes. These tests include a patch test, intradermal allergy test, or skin prick test that will help identify the specific irritants and allergens that affect you individually. Now that we’ve discussed some of the tests you can have performed for preventative measures, obviously, the first step to treatment for dry eyelids and all kinds of dermatitis, particularly eyelid dermatitis, is to keep the area clean and avoid touching or scratching the area. This will help prevent further infection, irritation, or inflammation. If you notice the recurrence of symptoms after exposure to a specific substance, prevent yourself from being in an environment with that specific irritant until you can determine whether it is the cause following consultation of your primary care provider. As previously mentioned, it is important to have a consistent general hygiene protocol in place for not only prevention but also treatment. This applies to not only your eyelids but also your hands. If you work in an environment that is dusty, contaminated, or uses other chemical agents, always utilize the appropriate eye protection and ensure that you wash your hands and affected areas before and after leaving these areas. As previously mentioned, identifying the cause of the dry skin on your eyelids is the largest step in successfully treating the condition. To find the cause, you may need to go through some trial and error to see if anything in particular that you can pinpoint is causing the irritation. From there, you may need to visit your eye doctor to get their opinion on the cause. Sometimes a second opinion can really open your eyes, excuse my pun, to the cause of your dry eyelids. Once you know the cause of your dry eyes and lids, it can be easier to identify a treatment method. Plus, by avoiding the cause of your irritation (if there is one), you can help prevent dry eyelids from forming in the first place. At home treatment methods include cold compresses, cucumber slices, or Aloe Vera gel, among other remedies. You can also use various moisturizing creams, generally staying away from powders. It is important to keep in mind the ingredients that might be in these creams may be the irritant leading to your symptoms. Stop using any creams that make symptoms worse and take note of the ingredients in any product you try. If your condition is fairly severe, you may also be prescribed various medications by your physician. You may also be prescribed corticosteroids, which are steroid-based creams that can be applied directly to the eyelids (although you should avoid your eyes, generally). Before you begin your own regimen, discuss with your physician the various risks and benefits of whatever medication you may have been prescribed to identify which treatment course is best for you. As mentioned throughout this article, there are creams and other products designed to help treat, soothe, and prevent dry, flaky eyelids. Below we briefly mention a few products that might be suited for you in treating your dry skin. Continue reading to learn about the different products and see which is right for you. The Heyedrate Lid & Lash Cleanser is a spray that can be used to treat dry or itchy patches on the eyelids. The product is reported to effectively kill microorganisms, leading to decreased inflammation. That’s important because inflammation often causes dry eyelids in the first place. It utilizes a proprietary hypochlorous acid blend and is safe for use around your eyes. Always check products to make sure they are safe to use on or around your eyes, and best practices for doing so. The product is also alcohol-free, fragrance-free, organic, vegan, and all-natural with no parabens, sulfates, or preservatives. To use the product, simply clean your eyelids and spray the solution onto the cleaned area (your closed eyelids). You can gently rub it in or let it dry on its own; it is not necessary to rinse or remove the product – bonus perk if you’re feeling a little lazy! 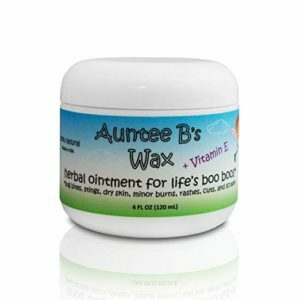 Auntee B’s Wax is an organic cream that can be used to treat various skin conditions, including eczema, psoriasis, diaper rash, and more. It is made up of a blend of 100% natural ingredients, including organic plantain leaf, shea butter, coconut oil, beeswax, and Vitamin E. Although it is not designed specifically to treat dry eyes, it is safe for use on the eyes and can be used for severely dry skin. Many people use this product on their eyelids, as well as other common dry skin areas like knees, elbows, and the bottoms of feet. This product is advertised as safe for use in children and infants as well. 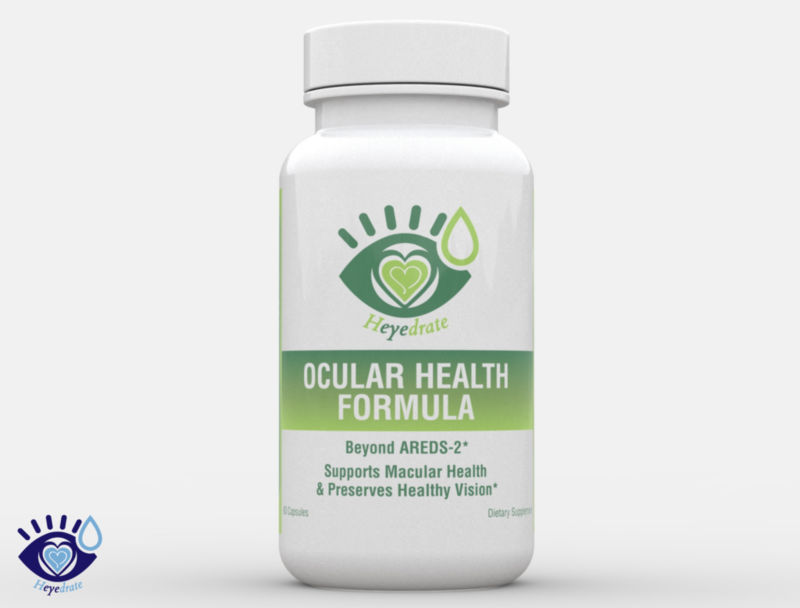 Heyedrate’s omega-3 product is unique from other omega-3 products as it is designed specifically with the goal of providing relief for dry and irritated eyes. It is well known that omega-3 fatty acids are essential for various physiological processes and play an important role in maintaining general health. Unlike other products, the company is transparent regarding the ingredients and dosages utilized in this pill, which are as follows: 515mg EPA, 415mg DHA, 40mg Omega 7, 50 IU Vitamin E, 100mg Vitamin C, 10mg Vitamin B-6, 20mg Magnesium, and 10mg Lactoferrin. 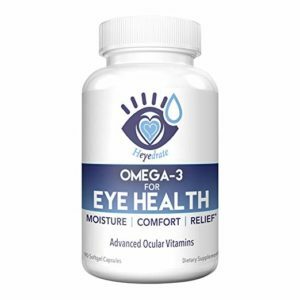 Heyedrate designed this fish oil supplement to ensure that you provide your eyes with more moisture and comfort, and relief from irritation and dryness. The combination of these ingredients is aimed to provide anti-inflammatory effects, and it works on not only your dry eyes, but your dry skin as well. A minor detail, but this product is advertised to not have the fishy burp that is often associated with other omega-3 fish oil products. So if that’s been an issue for you in the past, look no further! This anti-itch cream is formulated to provide relief and treat multiple forms of dermatitis. The company ensures that they removed multiple potential allergens from the ingredients to prevent allergic reactions. Its medical grade formula is non-toxic and provides relief from itching, inflammation, and rashes. 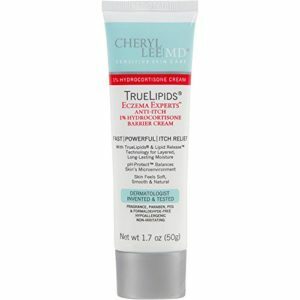 It is also safe for use on all skin types and ages and can be used to treat dry eyelids. SkinSmart Hypochlorous Spray was created as an antimicrobial liquid to promote the healing of skin from irritation. It was initially brought over from wound care centers where it was found to be highly effective. 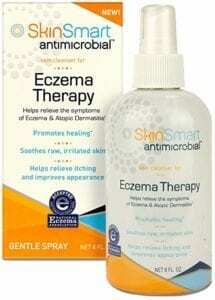 Unlike some of the previously mentioned products, it is not an eczema cream or hydrocortisone steroid. Additionally, you can use it without worrying about dosages. It is recommended that you spray an area whenever you experience an itch and it is designed to control bacteria. This product is also safe for use on the scalp and face, and you can use it on your eyes. It is noted that the use of this product might result in a mild stinging sensation, so please try this product on a different part of your body before applying near your eyes to ensure that you do not experience this potential side effect. It’s really easy to use, simply use the spray and let it air dry. 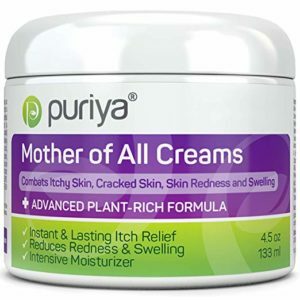 Puriya’s cream is designed to target many skin-related symptoms, including itchy skin, cracked skin, redness, and swelling. They market a blend of 13 natural ingredients, including Amaranth oil, which has been shown to protect against infections, stimulate cell repair and regeneration. This product is designed to additionally help treat itchy, dry, cracked, flaky skin, and subsequently improve skin health and overall condition. It also deeply hydrates and softens the skin and is free of any harmful chemicals. As with all products mentioned in this article, it is safe for use on all skin, including the eyes. 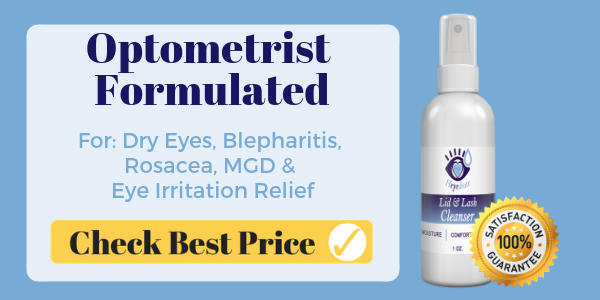 This supplement is not necessarily a product designed to help treat dry eyelids but acts as a general supplement to enhance eye health and vision. It includes various antioxidants that are involved in promoting eye health and function, including Lutein, Zeaxanthin, and Astaxanthin. It also includes Vitamin C, Vitamin D, Vitamin E, Zinc, Copper, Selenium, Vitamin B-6, Folate, Lutein, Zeaxanthin, Bilberry, Alpha-Lipoic Acid, Grapeseed Extract, and L-Glutathione. These additional ingredients help promote retinal function and health. Which is the Best Product to Treat Your Dry Eyelids? The best product for you can only be decided based on the cause of your condition, allergies, skin type, and personal preference. While we recommend all the products mentioned above, take careful assessment of the ingredients and intended uses to help you find the best option for your condition. As with all health conditions, please consult with your primary care provider before starting the use of any of these listed products, as well as any other product or supplement. They may result in negative side effects or worsen symptoms, so take the time to discuss various treatment options and the one that will work best for you with a medical professional.